Hello DIYhard boat builders! I'm back again with another question. Last summer my daughter and I built the Bolger dory and much rowing ensued. We explored up and down the river and had lots of daddy daughter time. My kiddo wants badly to build again. Like a budding naval architect she is talking about building an 18 foot cat boat. Last year almost killed me. I had no idea how to build a boat before we started and we pulled through. I was hoping to use the easy button. Can I build this thing as a skin on frame boat? I know she won't carry much sail because she'll be light and won't draw much water but I think it would be the fastest way from start to finish. I thought it would be clever to have a small ring of thin deck around the edge to hide our positive boyancy. I was hoping this would weigh in less than 100 pounds as well - at least the hull. I can make all the parts come off/out. Our experiences with the dory and trailer have been less than fantastic and I would prefer to car top. The design she has picked out is the south bay cat boat. Any and all comments, questions, howls of indignation, and (hopefully) simple pictures with labels and instructions are welcome. 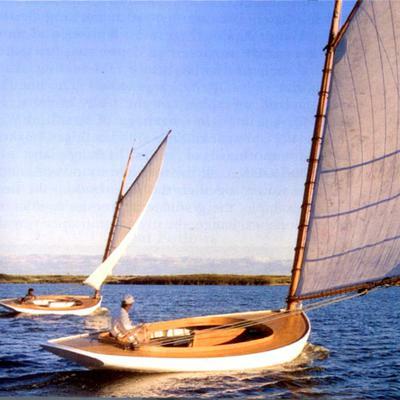 Comments for Skin on frame catboat? I will certainly try to keep working on this but Im having more medical issues this year. I'll keep you in the loop if we start this project. Right now it doesn't look good. Zack just to see whats out there not a nail in it and as large as you wish click on thumb nail www.skin on frame. org these are all about nots. Zach just had to look but didn’t think there was a school for skin boats and some of them much larger the one would think even the boat you and your doughtier built but in skin can be held over your head with one hand. So, have a look at Pinterest skin boats a few girls there doing just that. Good luck Zack thinking of building a pirate ship for my grandson eight x thirty with Center board house work on the stern he loves the shallows we do have a lot of marine life her in BC. That's what I keep telling the kid. Do you have any more details about this 20 foot skin framed catboat? I would love to hear. I did a little tape measure/living room arithmatic last night and I think a waterline of 15 feet and overall length of around 18 would suit us fine. I figured 7 or 8 foot beam but I will have to look at more plans. I have seen a twenty foot Whitehall with skin fabric and this may be a challenge but nothing is impossible. The word can’t for smart boat builder is only a glitch. 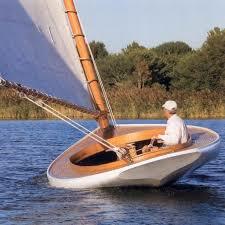 If she is going for it get her to connect with the architect put it on google + Pinterest wooden boat, you will find skin boats as a car top boat. There are some new gadgets to get it loaded but for me the trailer the is the way to go, it just takes practice. With a skin boat you need to be twice as careful when loading unloading, sharp objects. A lightweight sail like a surf sail could be made, the frame also could be laser cut or steam bent and bolted. The center board would be your weak spot to seal but not impossible with a gasket. Like to hear what mike has to say but did enjoy your first build, my oldest daughter loved working on my boats but will not go out on the water. Like to hear how she makes out. Hey, hadn’t heard of them before. Why don’t you get in touch with them see if they can help? If only if it was so simple! So neither of those would work out for us. Plus we have been skulking around in the shallows up and down the saint joseph. That's why I figured the catboat might be doable. The little 12 footer would just be comically small. Like a clown car small. I was hoping the SOF would let us get a little more room with less weight. I saw the Chamberlain Gunning Dory from Gentry Custom Boats and I figured that would be about the right length. We just need a little more width. Hi Zach, your ‘kiddo’ certainly has an eye for a pretty boat. However, you would have problems trying to build a boat like that as skin on frame. And I don't think you would get plans for such a project anywhere. You could rig your dory out for sailing.